aka: The most dysfunctional, overdramatic and messed up family of all time. For the Percy Jackson Fanzine organised by Angela (Dreamsoffools) on Tumblr! o/ It's currently ongoing but should be completed soon, so if anyone is interested look here! I know one is persephone, one is Demeter, but which one? Do you think could you make an image like this for the titans? Or to the Gigantes from Heroes of Olympus? I just think there is TOO MANY fanarts only for the demigods, but it would really amazing if we had fanarts for the Kronos and his brothers and Sister or Alcyoneu and his brothers, or even maybe scenes like Typhong attacking the gods, or maybe Mars appearing in Camp Jupiter. 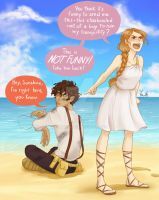 I just think we should have MORE Fanarts about another beings or scenes, instead of only the demigods over and over again. Now about THIS fanart, this is one of the my favorites fanarts EVER!! It is really amazing how you can put the olympians with their different personalities in one image. Finally I found the original artist of this. I’ve loved this pic ever since I found it on Pinterest, but I wasn’t sure if the artist was here on Deviantart or not since I could never bring up the pic in my searches (and there wasn't a link back on Pinterest. Now that I've found you, I will make sure to put a link back to this on the pic I pinned over there.). Anyway… I just wanted to tell you how spot-on you got everyone in this! It’s the ONLY piece of fanart I’ve seen of the gods and goddesses where they actually look exactly as I picture them in my mind while reading the books, especially when it comes to Hades and Hermes. Wonderful job! And wonderful style as well! Who is the one at the bottom left corner ? i think the fact that Apollo is....almost androgynous is a good thing, that's kinda the way I've always pictured him in my head. this is a freaking amazing piece!!! Why does the FRIENDS theme song start to play in my head when ever I see this pic. Oh mh God, that's just awesome. Maybe that's what Apollo's singing. dont you mean oh my gods? There's only one god. The girl knows his name. PERFECT. EVERY ONE OF THEM. there are 2 goddesses i am not able to recognize , the one with the dark skin and hair draped in gold, and the one messing with the flowers in Dionysus's hair? I love how you didn't just show the Gods, but also their relationships to each other. Beautifully done. WOW. can i just say i love all your stuff? i first saw your drawing of the Gone series characters and i can only dream of doing the stuff you do. You're so talented, keep it up! The four below them: Athena, Hephaestus, Hera, annnnnd .... Demeter? And then Hermes on the far left, with Apollo and Artemis next to him, followed by Hesta in the cloak, Dionysus, and finally Persephone. Dude. Your awesomeness knows no bounds. You really captured their personalities, good job! Oh my gods!!!! This is so cool! You did an amazing job at showing the different gods and goddesses emotions and personalities perfectly!!! You can see they're attitudes towards each other and they're reactions are spot on! 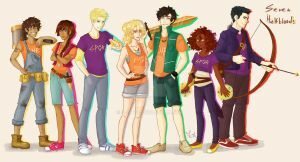 I personally can tell the difference between all of them because they're how I imagined them when I read Percy Jackson! The coloring is great and you have displayed the most chaotic family in all of history wonderfully! Who is the one standing right above Dionysus? Is is Persephone? I believe it is Demeter because the order from top to bottom seems to be vaguely be going from the oldest appearance to the youngest appearance. (And if you read Percy Jackson you know that there might be some older gods/goddesses at the bottom but they take on younger appearances.) I also think that it's Demeter because she was the goddess of the harvest/agriculture and grain is what she talks about the most in the books and that's what's on her dress. She is also giving Hades a hateful look and which comes from how he basically kidnapped her daughter Persephone. Now I think Persephone is closer to the bottom putting flowers on Dionysus because she not only looks younger looks younger but she is the goddess of spring so that means flowers and green plants which she is putting on Dionysus's head and are around her arms. Sorry for long explanation but felt that I needed to explain myself thoroughly! I asked if the one directly above Dionysus, playing with the flowers was Persephone. Oh wow, I feel really dumb right now. For some reason I thought you were asking if it was Persephone under Hades. I'm soooo sorry. No, don't be sorry! I enjoyed that lovely speech. Thanks. At my school, if you don't have more than two legitimate reasons for something, most of the other students kind of ignore your argument, so I'm use to having to list a bunch of reasons why I think something. It's somewhat of an unspoken rule there. Huh. That's really interesting. At my school, when we write essays and stuff, we have to have at least three. Same with our essays. We also have to have text evidence to back almost everything up if it's an essay for a book.